Watermarks do not appear on original artworks. No copyrights are transferred with the sale of these works; the artist retains all copyrights and publishing rights (you may re-sell the original art, but you may not reproduce the image for distribution by any means: physical, electronic, or otherwise). Ink, and white gel pen on toned paper. Artwork is approximately 10” x 5 7/8”. Shipped with backing board and protective clear bag. Ink, and white gel pen on toned paper. Artwork is approximately 4 6/8” x 3 7/8” (page is 10” x 5 7/8”). Shipped with backing board and protective clear bag. Ink, metallic gel pen, and graphite on toned paper. Artwork is approximately 9” x 5 7/8”. Shipped with backing board and protective clear bag. 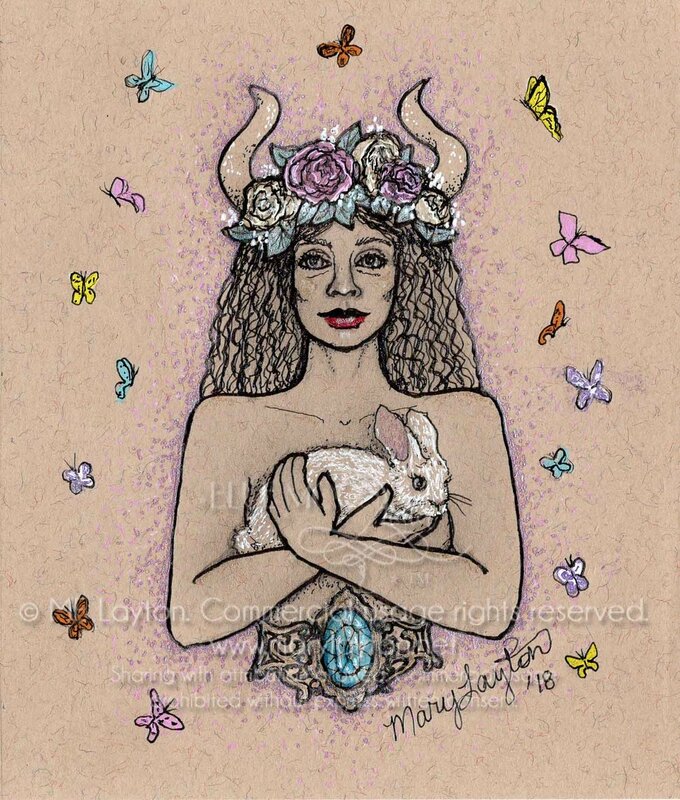 Artwork by Mary Layton. Summer, Autumn, Winter, & Spring - horned seasonal fae creatures: metallic, glitter, pastel, and white gel pens, and ink on toned paper. These images are hard to capture accurately via scan, the inks react to light with a lovely shimmer effect. Available individually or as a set. Each original artwork, approximately 5 3/4” by 5”.